Is the Regulatory Compact Broken in Sub-Saharan Africa? As we teach our students in econ 101, the prices of most goods and services reflect both demand and supply factors. 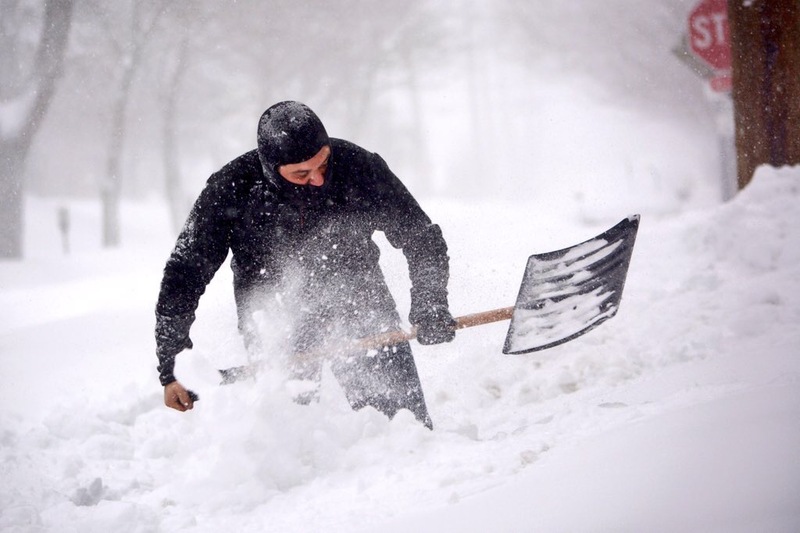 So, to use a classic example, the price of snow shovels may go up during a blizzard, even if it costs no more to supply them when it’s snowing. On the other hand, as we teach our students in regulatory economics 101, prices for regulated utilities are different. Their prices are driven almost purely by costs and, not just current costs, but costs incurred in the past that other businesses might write off as sunk. In the textbook model, regulated utilities are what we call “natural monopolies.” They are supplying a good for which it makes the most economic sense to have a single supplier. This could be driven by the high fixed costs of building the transmission and distribution system to supply electricity, for example. Regulated utilities are implicit signatories to what’s called the “regulatory compact.” Basically, the regulator gets to set prices for the utility, ensuring that the company won’t take advantage of its monopoly position to charge prices through the roof. And, the regulator requires that the company offer universal service to anyone who wants it at the regulated prices. In exchange, the company gets assurance that it will be allowed to collect revenues to cover reasonable costs of doing business. In the US, this is formalized through decades of judicial and regulatory decisions, for example, describing “just and reasonable” rates and “prudently incurred” costs. According to a fascinating report recently released by the World Bank, the regulatory compact appears seriously out of whack in Sub-Saharan Africa. The figure below highlights the problem. Each bar reflects the situation in a single country. The red diamonds reflect the cash collected per kWh by the main electricity provider (most are vertically integrated monopolies), and the purple and green bars reflect the costs. Note that for all but two of the countries, the dots are to the left of the bars. This means that the companies’ revenues are not covering their costs. But, who is breaking the deal? Are companies’ costs too high? Perhaps “imprudent” in some sense, maybe due to corruption? Or, are the local regulators setting prices that are too low? Or, is it some combination of the two? It’s first worth noting that only some of the countries in Sub-Saharan Africa have regulatory agencies, and only a subset of those have any real power over prices, so we’re using the “regulatory” part of the “regulatory compact” broadly. We recently saw these issues up close in Tanzania. As part of a DFID-funded research program on Energy and Economic Growth, we organized a policy conference in Dar es Salaam, together with our partners at Oxford Policy Management. 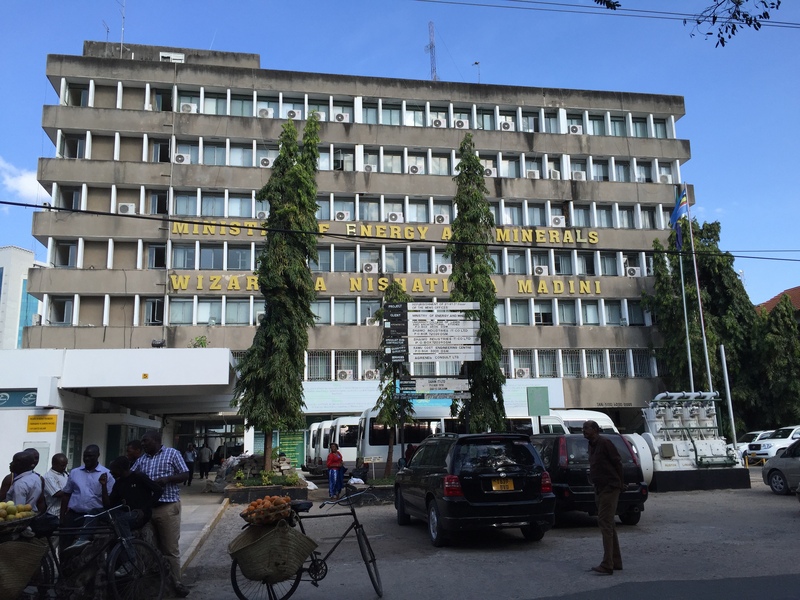 Tanzania’s local monopoly, the Tanzania Electric Supply Company (TANESCO), only collects revenues to cover 82% of its costs (14 out of 17 cents per kWh), based on the World Bank calculations above. TANESCO is a vertically integrated utility, and the government owns 100% of its shares. According to people close to the company, the rate-setting process is highly politicized, so rates are poorly aligned with TANESCO’s claimed costs. They point out that on the day the new Minister of Energy was appointed, he announced his intention to initiate a rate cut. On the other hand, the regulators seem to believe that TANESCO’s costs are not “prudently incurred,” though they didn’t use that phrase explicitly. They argue that the company is inefficient, and the rates would easily cover costs if they cut fat. It’s difficult to know who is right. Consider TANESCO’s recent experience procuring power from independent backup generators. Historically, over half of the country’s annual generation came from hydroelectric generators. In 2010, a severe drought led to persistent electricity shortages, so TANESCO signed several contracts for what’s been called “emergency” generation, including a contract with a company that owned two 50 megawatt diesel generators. Diesel prices were high in 2011 and 2012, though, and, under the contract, TANESCO had to pay the fuel costs. TANESCO’s losses during that period were reportedly more like 50% of their total costs. Now, the company is saddled with debt from this period, but the regulator contends that the emergency generation costs were too high and is unwilling to raise rates to cover the accumulated debt. Also, the regulator increased rates by 40% in 2014, so may feel like it’s already done its part. Figuring out what the right prices for generation procured in an emergency is difficult, though. Presumably, the utility did not have much time to shop around. Then again, maybe it should have foreseen the emergency situation and planned to avoid it. Tanzania, like many countries in the developing world, also experiences high levels of “nontechnical losses” (largely theft). So, even if rates are set to cover costs if most consumers pay, the companies will experience heavy losses. Theft appears to have a political component as well, though. This paper, by Brian Min and Miriam Golden, shows that nontechnical losses in India increase when elections are near. The World Bank report divides each utility’s losses into four categories: underpricing (meaning the regulators are breaking the deal and setting prices lower than what would be required to cover reasonable costs), bill collection losses (meaning the utility bills for the consumption, but fails to collect), transmission and distribution losses (a combination of technical line losses above an acceptable limit and theft) and overstaffing (relative to a benchmark, suggesting the company’s costs are imprudently high). They do not attempt to identify other types of inefficiencies, such as purchase power costs that are too high. They find no underpricing in Tanzania – suggesting the regulators are upholding their side of the compact. They attribute 80% of the losses to bill collection and nontechnical losses – suggesting the company needs to improve their billing system and distribution network. The remaining 20% is due to over-staffing. In its current situation, though, TANESCO struggles to finance its ongoing operations, let alone the investments needed to achieve fewer billing and distribution losses, so more price increases may be needed in the short run. The new Energy and Economic Growth program will sponsor research to address some of these key questions and issues. First, we suspect there are real costs in terms of economic growth and other development outcomes due to the kind of institutional breakdown documented in the World Bank report. We need to document the extent to which economic growth is constrained by unreliable power, for example. We aim to measure costs like this by collecting new data and conducting new analyses. Second, we will work with policymakers, regulators, the utilities and other stakeholders to learn about the best ways to improve the institutions. Previous Previous post: If a Tree Falls in the Forest…Should We Use It to Generate Electricity? The World bank report sighted in this blog “Financial Viability of Electricity Sectors in Sub-Saharan Africa”, August 2016, draws an accurate picture in my view of the financial viability of electricity sectors in Sub – Saharan Africa but also the developing world at large based on consulting studies my office conducted over the past twenty plus years in particularly West Asia and Africa. 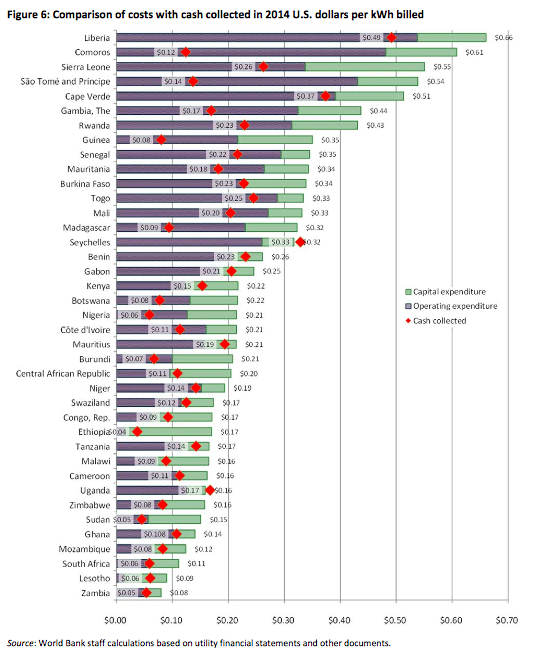 The average revenue per kWh collected in these countries is typically below the cost of operating the utility system in both the long term as well as the short term indicating the inability of the sector to meet the cost of power system expansion or even the cost of operating the system without government subsides. This in fact is true for all: government owned utilities, quasi-government owned utilities, as well as investor owned utilities in these countries. It is however important to point out prior to passing judgement on utilities and regulatory agencies in these countries the need to examine the capabilities, the mandate, and the context these entities operate under. Many Sub-Saharan countries lack formal regulatory frameworks altogether. In many countries, regulation is by default conducted through the issue of executive orders. Regulatory agencies where they exist, do not share the regulatory setting and mandate of regulatory agencies in the United States or Europe. More often than not, regulatory agencies have the power to recommend changes to electricity tariff but not to approve and enforce adjustments to tariffs. Almost all developing countries where a regulatory framework exist lack sufficiently complete regulatory frameworks. A regulatory framework may have implementing regulations in place but may lack the specific rules that address the setting of tariffs and the regulation, licensing, and monitoring of utilities performance. In a large number of these countries, the system planning function is the domain of the utilities with limited or no oversight to the regulatory agency over utility decisions on capacity expansion with decision on capital funding residing in ministries of finance or other. Plant prudency tests by regulatory agencies in these countries is not conducted. To a good extent, the regulatory process if it exists is shared or captured by the government and the utilities with no role to consumers or public interest groups. In almost all developing countries we have worked in, none of the regulatory agencies have the required range of legislative, judiciary, and executive powers necessary to adequately conduct their duties. Worse still, in every developing country we worked in, neither the regulatory agency nor the utilities appear to possess the required information or estimates of cost of service to attempt an exercise of revenue requirements estimation leave alone rate design. In several studies we conducted, we found tariff structures not to be reflective of cost of service and significantly above or below cost of service leading to significant cross subsides within consumer classes. In basically all developing countries, utilities are in the first place instruments of public policy and in the second place business or commercial entities. 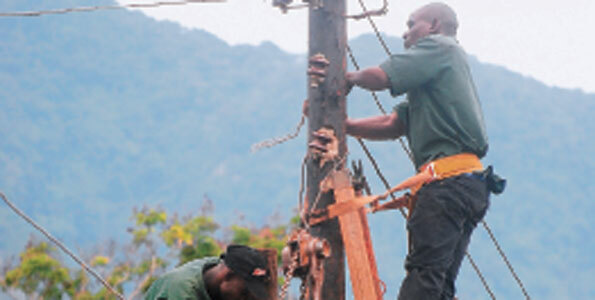 Given the grim picture we draw here of regulators and utilities in the developing countries, it should not come as a surprise that in these countries the quality of power services is poor, that utilities are overstaffed, that electrification of rural and urban areas is lagging behind, and that the overall cost of power delivery is excessive. This prognosis is made at a time Sub-Saharan Africa is expected to meet a mounting challenge in expanding and equipping its electricity infrastructure. The requirement in Sub-Saharan Africa is paramount for massive improvement in the system planning function, regulatory capacity and the development of market, policy, and institutional frameworks. Having said all this, it is unrealistic to expect regulatory agencies and utilities in much of the developing countries to perform and abide by the regulatory compact of the United States and Europe. Policymakers and advisors are indeed finding that the framework of traditional regulatory theory, elaborated and applied in the developed world, is of much more limited use in developing countries. I would strongly invite the readers of this blog to read the last book written by Jean-Jacques Laffont before his untimely death, 2005, Regulation and Development, Cambridge and New York: Cambridge University Press. As noted by Laffont, four major limitations of developing countries can be identified to which we can attribute the difficulties of the power sector in Sub-Saharan Africa today: limited regulatory capacity, limited commitment, limited accountability, and limited fiscal efficiency. How do electricity theft and investment in grid expansion to rural areas factor into the mismatch between rates and costs. Most of these countries still lack grad access to the majority of their populations in rural areas. Should investments in grid expansion (or subsidies for off-grid energy for under-served areas) ultimately covered by the rate base as well? Per the World bank report, Electricity Company of Ghana collects 77% of the S0.14/kWh costs. Even if “rate setting” is not politicized and costs are prudently incurred, it is my belief that majority of the consumers’ proportional income earned in cedis falls below the costs incurred mostly in dollars. Consumer inability to pay is a crucial factor driving the losses in the form of illegal connections and corruption of ECG collectors. Unless one wants to price out many consumers, the ways in which prudently incurred costs can be made affordable such as funding more efficient production, transmission and distribution as well as making it easier for the poor to acquire more efficient end uses would need to be considered. Research need to go beyond the ordinary – not relying solely on regulators, sources close to generators, politicians and previous research for data, to primary research that collects actual consumption field data, while using ideal production costs and incorporate interventionist strategies that make all consumers able to acquire efficient end uses and investment that reduce transmission and distribution costs such as feed in solar plants near consumption population. Just an unconventional thought on the answer to the difficult question of who is right on costs and rate setting. Nice post. I’m glad to see more focus on the various components of costs in an effort to separate legitimate from wasteful utility actions. I think many of the utilities are technically insolvent due to shortfalls in ratepayer funds but able to rely on taxpayer funds to make up the difference. It is a crutch but since they are state-owned it is something they can lean on and have become dependent on. They could get better deals (lower bids for new generation based on lower required rates of return) if they reformed this and improved their credit. Energy Institute Blog Is the Regulatory Compact Broken in Sub-Saharan Africa?